This Belgian tapestry "Oval Still Life Green" shows a floral still life with an ornate floral oval border. Filled with detail throughout, this piece shows the Belgian love of flowers as a subject for still life art. Here we see the central arrangement of flowers with an intricate border made up of floral designs. This floral Belgian tapestry "Oval Still Life Green" is backed with a lining and has a tunnel for easy hanging. 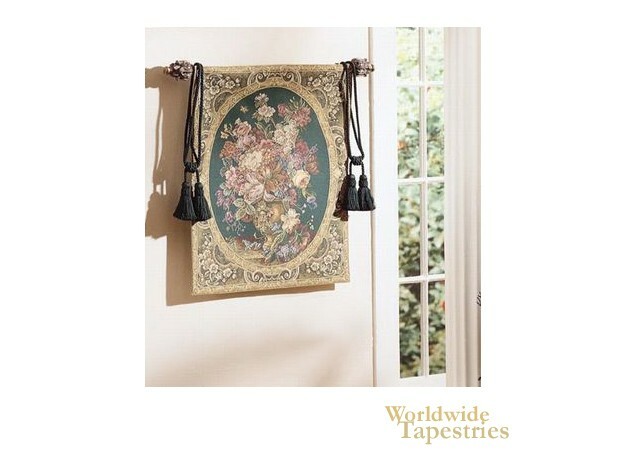 Note: tapestry rod and tassels, where pictured, are not included in the price.